Chef Paulette started her culinary adventure at the age of 10 in Rochester New York, when she received her first cook book from her Mother, who was a fabulous cook. Paulette cooked for family and friends as often as possible. Needless to say food became a huge part of her family life and a way to show her love. She took the conventional path, however, after graduating from Rochester Institute of Technology where she earned a degree in Print Management. She enjoyed a long and successful career in the commercial print industry until 2009 when the sluggish economy affected that career. She was presented with the opportunity to go back to school to earn a culinary degree and graduated from Guilford Technical Community College in 2012. While attending school she interned at The Stocked Pot under Andrew McMillan and Chef Donald McMillan. While there she developed her skills and love for all things pastry. 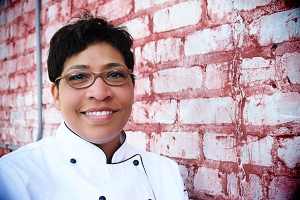 Currently Chef Paulette is Catering Sous Chef at Forsyth Medical Center, Pastry Chef, Instructor at The Stocked Pot Cooking School and Pastry Chef for Catering by Simple Elegance.